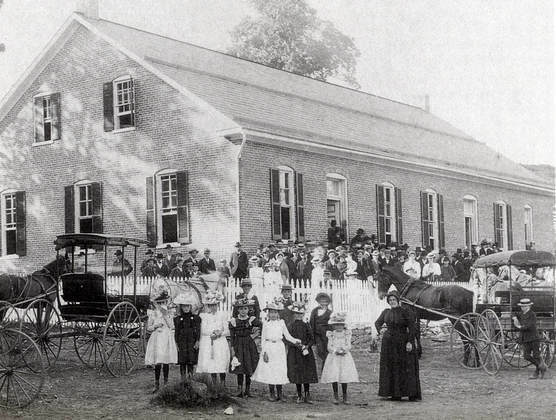 German Church of the Brethren, or Grossnickle's Meeting House, Circa 1895. The congregants posed on a sunny summer day with many of the women wearing fashionable straw boater hats. The meeting house is located Ellerton. Grossnickle's Meeting House, Ellerton, Circa 1895. 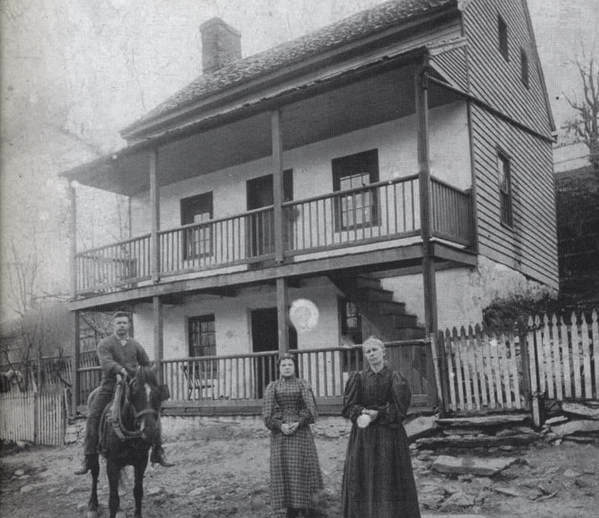 Calvin, Annie, and Magdalena Kinna Gladhill in Front of Their Home, Harmony, Circa 1895. Calvin Tressler Kinna Gladhill (1874-1935) founded the Gladhill Furniture Company, still in operation in Middletown today. Courtesy John C. Gladhill. Wolfsville Band Marching Along Pleasant Walk Road, Circa 1900. 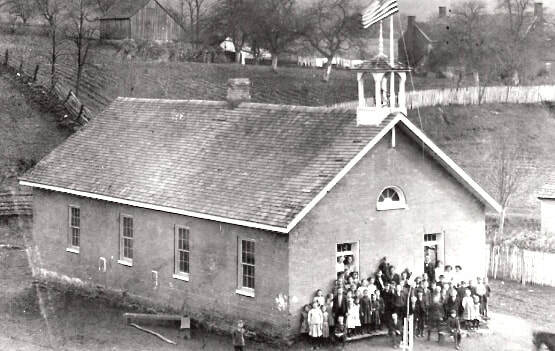 Harmony School, Circa 1900. 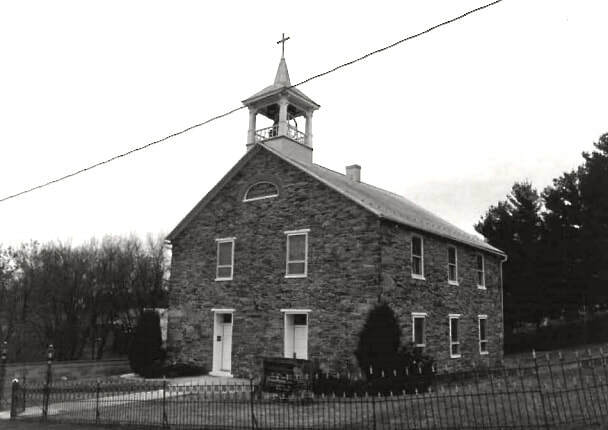 This school was located across the road from Harmony Lutheran Church. It was later replaced by a wooden school house. Courtesy Carroll Leatherman. On 3 Nov., 2018, Lorraine McAfee wrote: "Thank you for posting the photograph of the Harmony School. 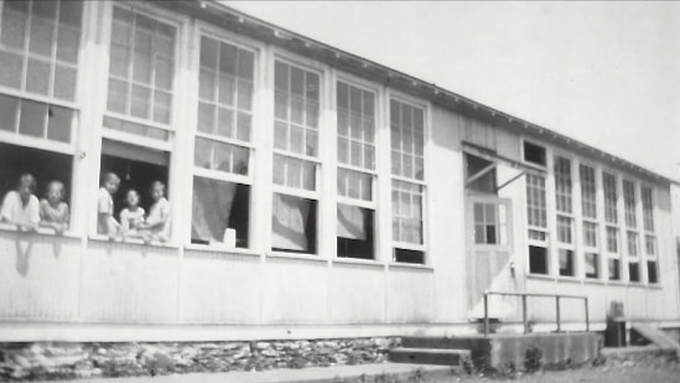 I remember a photograph of the old Harmony School that hung in my grandparents home on the corner of Harmony Road and Brethren Church Road (Charlie Ford's Store). I don't know what happened to it after my grandparents died. I was raised in the house that you see in the upper/right corner of the Harmony School photo. I now know that a barn once stood where the chicken house was when I was a child/young adult. The foundation of the chicken house was stone and large, so it was likely the original foundation of the barn. Mother had the chicken house, hog pen, and outhouse taken down sometime between 1990-2006." Left: This schoolmaster's bell from the Old Harmony School was donated to the historical society by Mary Clark Leatherman in loving memory of her husband, Carroll Feete Leatherman, Jr. Students would have heard it rung each day to mark the beginning of classes. Harmony, Circa 1900. 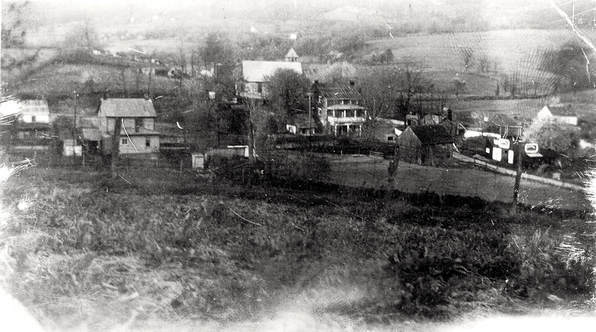 An early photograph of Harmony, looking toward Ford's Store. Courtesy Wisner family. 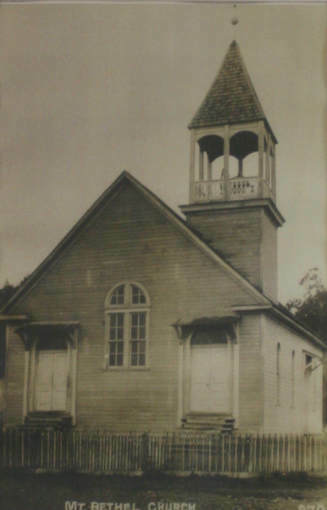 Mount Bethel Methodist Church, Circa 1905. Located between Wolfsville and Foxville, it was founded in 1836 and was a log structure until this replacement was built in 1902. Postcard Addressed to Nellie johnson of Church Hill, Circa 1900. Ellerton School, Circa 1910. The boy seated on the steps is Elmer Shepley. Ellerton School, Circa 1910. The roster includes a plethora of local family names, including Routzan, Sheply, Leatherman, Main, Grossnickle, Harshman, Summers, and Gouker. Courtesy ​Jennifer Ogle Saavedra. Black Rock Hotel, Circa 1916. 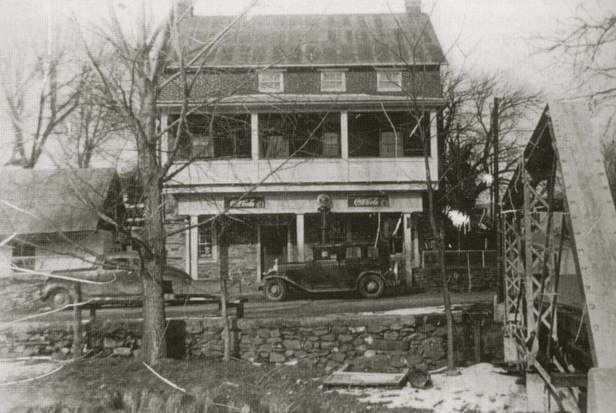 Walter C. Rowe of Myersville took this photo of the hotel that once stood on South Mountain. Open as early as 1820s, the Black Rock Hotel burned down sometime after 1920. Highland Falls, Ellerton, Postcard, 1922. This waterfall near Ellerton is also known as Highland Falls and Great Falls, but is now known as the Cascade. Although the image is from a decade earlier, this postcard was postmarked 24 December, 1922. It is addressed to Mr. S. Schmall, 4549 Calumet St., Chicago, IL. The delightful message reads, "Thank you dear for the nice letter you send [sic]​ us and all the kisses. Hope you are a good boy. Did you throw Herbert out of bed Sunday morning? Love to you & all. Aunt Alice." Courtesy Ann Longmore-Etheridge. Fiftieth Anniversary of Mahlon Benjamin Green and Mary Ellen Salina Hoffman Green, Church Hill, July 1922. The couple married 14 July, 1872. Mahlon was born in the upper Middletown Valley near Ellerton on May 21, 1848, a son of Samuel and Sarah Rice Green of Church Hill. 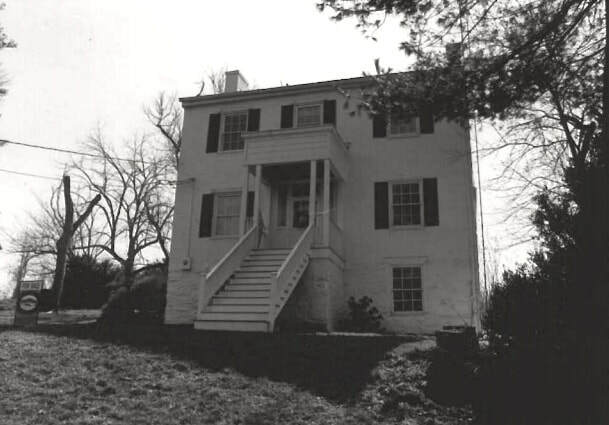 Benjamin farmed the same land as his father and maternal grandfather -- 9-1/2 acres called "Shady Grove" on Church Hill and Md. Route 17. Baker Family Reunion on the Ezra Baker Farm, Harmony, Circa 1920. Courtesy Mary Sprecht. Jerusalem Cemetery in the Early to Mid-1900s. Gaver Family Reunion, Circa 1930. Lewis Franklin Gaver (1866-1944) and Minnie Victoria Schroyer (1872-1934) are seated front row, center. New Harmony School, Circa 1930. Courtesy Wisner family. 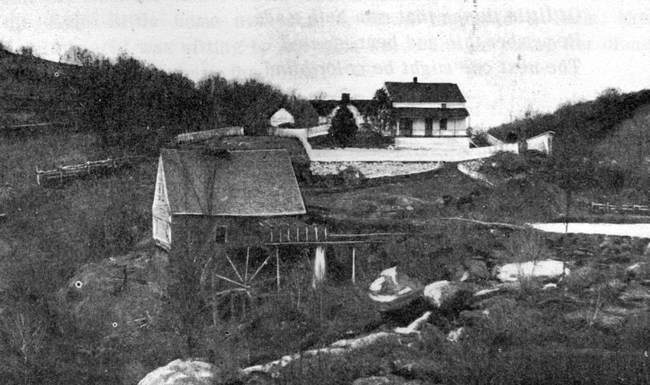 Middlepoint Covered Bridge, Circa 1930. The bridge was built in 1841 and was pulled down in 1933. No one knew it then, but it was a terrible loss to Frederick County's 21st Century history tourism. Locals used the remains for firewood. Courtesy Draper family. 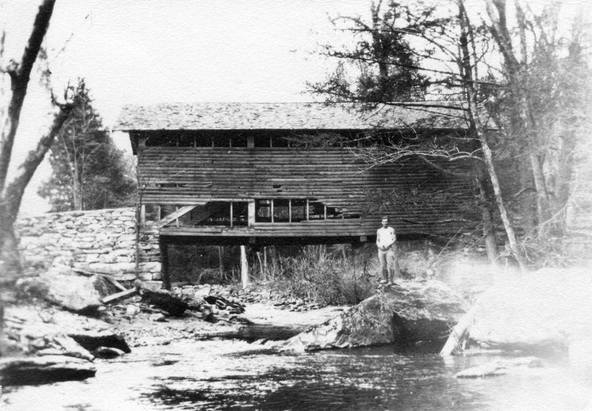 Harmony Grist Mill, Circa 1930. The old gristmill later served as woolens factory, post office, and radio and television repair shop. Courtesy Wisner family. Harmony Band, Circa 1935. Band leader Les Brandenburg (1894-1947) is center front. Gaver Family Reunion, Circa 1945. 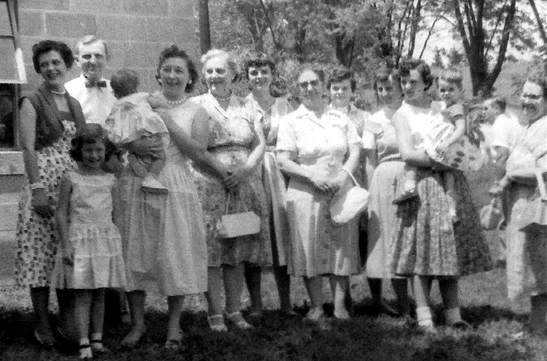 Grossnickle Reunion, 1957. This gathering took place at Grossnickle's Church of the Brethren, Ellerton. Metzer Farm, Ellerton, Circa 1970. St. John's Lutheran Church, Church Hill, 1992. Built in 1830 to replace an earlier log structure, according to geneaologist Bob Fout, "The interior was just one large room, with wrap-around galleries on three sides. In keeping with German tradition, the sanctuary was designed with two front doors, one for gentlemen and one for ladies. In the beginning, the church had no bell tower. Then in 1895, carpenters constructed a belfry. A 700-pound church bell was cast in Cincinnati at a cost of over $200.00. Money was raised by donations from church members and public solicitation. Its melodious strains would call neighbors to worship each Sunday. It would also ring to alarm for fires and other emergencies. At the time of a death in the community, the tolling mechanism would count out the age of the deceased." Church Hill School, Church Hill, 1992. The school was built in 1912. To read a complete survey of the Church Hill area undertaken in the 1990s, click here. Harmony Road Bridge, Myersville, Circa 1992. Built in 1918, Harmony Road Bridge spans Little Catoctin Creek. Metal truss bridges were the most popular bridge form in the county between the 1870s and 1930s, facilitating vehicular movement throughout the developing region. Courtesy Library of Congress. Daniel Palmer House, Ellerton, 1992. The Daniel Palmer Farmstead was originally an agricultural complex, now a private residence, that was built about 1820 and is centered on a two-story brick dwelling with a three-bay north elevation and a rebuilt entry porch. Accompanying the house is a contemporary log or frame and stone summer kitchen and springhouse with german siding and an exterior brick and stone chimney, a circa 1850 brick bake oven and smokehouse combination, and a frame privy. 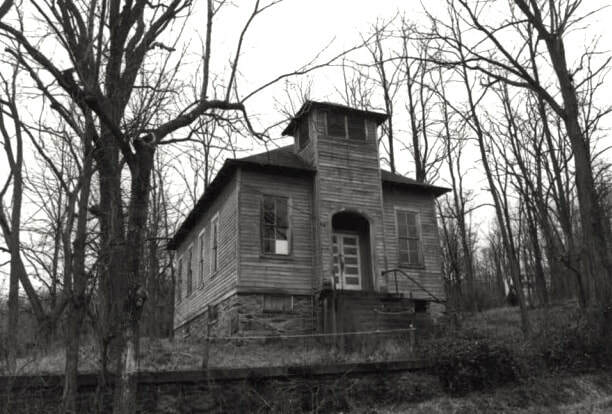 Highland School, Highland School Road, Near Myersville, March 1992. The Highland School is a one-story brick schoolhouse that was built 1852 and which was converted to residential use in 1942. ​St. 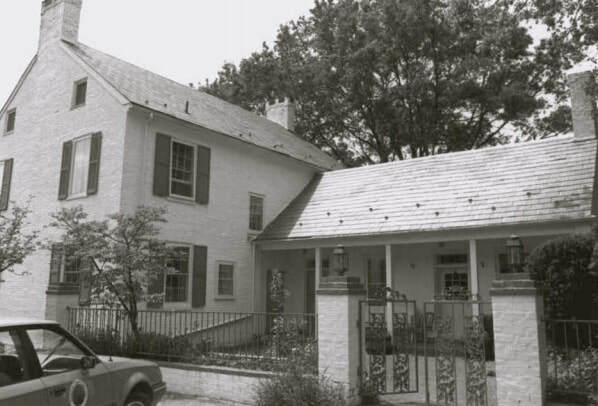 John's Lutheran Church Parsonage, Church Hill, 1992. The former parsonage is located at 3251 Ward Kline Road, and part of the Church Hill Survey District.